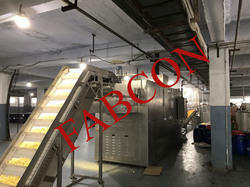 Fabcon BAKE Line consists of equipments which are placed considering their vital role in the efficient production of different snacks like Puff Ball, Chesse Ball, Rings, Nachos etc. Owning to our in-depth knowledge of this domain, we have been able to offer high quality Bake Line to our valuable customers. These machines are manufactured from high-grade materials SS-304 that are sourced from trusted vendors of the industry. Due to their robust design, user-friendly operations and energy efficient design, these products are highly demanded. 1) Complete S.S 304 grade construction. 3) Axial flow fan for air flow control. 4) Based on Design & Technique from overseas partner.